For legislative junkies, the Oklahoma Association of Electric Cooperatives (OAEC) features a phone application that serves as an excellent reference for all things #okleg. Named Oklahoma Legislative Guide, the app is available for free in the Apple App Store and on Google Play. 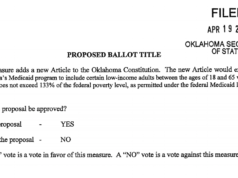 Here at NonDoc, we have not been paid or approached by OAEC to promote their phone app, but we feel the need to let observers of the Oklahoma Legislature know just how dang useful this thing is. Plus, the app’s developers have recently updated it with all the new members of Oklahoma’s 57th Legislature. And, while this app is amazing, we had a laugh at the fact that OAEC’s online legislative resources have not been updated in years. For quick facts about Oklahoma public officials, the app has a section detailing federal lawmakers, judiciary members, statewide office holders, and House and Senate members of the Oklahoma Legislature. Each section has a working search function, so it’s easy to find whichever officials for whom you might be looking. For every House and Senate member page, you can see when lawmakers face term limits. The pages also feature Capitol phone numbers, emails, committee assignments and what counties a legislator’s district encompasses. Having this information at your fingertips and so readily available has proven to be a godsend for anyone who deals with Oklahoma state politics. Additionally, the app includes a space under every lawmaker where you can add YOUR OWN NOTES. As if this app needed more functionality, there’s a state map section where you can tap and see who represents the location’s districts. The lawmakers’ profile pages also link to their districts on the map. The last feature is a calendar section that shows bill deadlines and tells you when session starts and will end. Ideally, once session starts, the calendar will be updated with committee meetings and such. We appreciate OAEC’s work on the Oklahoma Legislative Guide app, and we love that it’s free. If you pay much attention at all to the Oklahoma State Capitol, we recommend downloading it. It will make your life easier.